Goodreads says, "Fans of Jennifer E. Smith and Jenny Han will fall in love with this heartfelt and humor-laced debut following one girl’s race to find the guy of her cosmic dreams.When zodiac-obsessed teen Wilamena Carlisle discovers a planetary alignment that won’t repeat for a decade, she’s forced to tackle her greatest astrological fear: The Fifth House—relationships and love. But when Wil falls for a sensitive guitar player hailing from the wrong side of the astrology chart, she must decide whether a cosmically doomed love is worth rejecting her dead mother’s legacy and the very system she’s faithfully followed through a lifetime of unfailing belief." Wilamena, or Wil, is set on a journey to find her true love. Her now deceased mother was an expert astrologer and taught her everything there is to know about astrology and the stars. Consequently, it has also become Wil's passion, much to her grandmother's dismay. According to her horoscope, she has limited amount of time to find her true love. Enter Grant, the guy that Wil should probably stay away from, but won't. Instead she dates nice-guy Seth who is perfectly compatible with her. But why can't she stop bumping into Grant, who is clearly incompatible with her according to her astrology chart. Should she listen to her mother and put her faith in astrology or start living according to her own rules? Summer of Supernovas by Darcy Woods is a light and enjoyable beach read that's perfect for fans of contemporary young adult fiction. Wil is a fun character that I instantly enjoyed in Summer of Supernovas. I didn't necessarily approve of her every move throughout the novel, but that's what kept me interested. I definitely wanted to see how things would turn out for her. Would she feel the need to keep her mother's legacy alive by continuing to trust astrology or would she live a little according to what her heart says? The love triangle between Seth, Will, and Grant surprisingly didn't bother me. I think it works for a light beach read. While I wasn't swooning over the romance in the novel, it was still fun and endearing. All in all, I wasn't blown away by Summer of Supernovas, it was your standard YA beach read, but nonetheless, it was an enjoyable one that I wouldn't hesitate to take with me on vacation. I plan on keeping my eye on this debut author's work in the future. 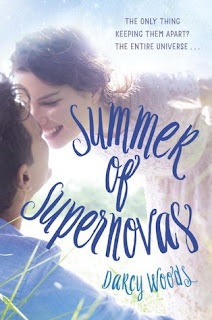 Thanks to Random House, I am giving away my gently used ARC of Summer of Supernovas to one lucky US reader. Please refer to my giveaway rules and the deadline is June 1st. Good luck! Definitely the perfect beach read. The kind that doesn't require too much thinking, nevertheless, fun. Yes....very true! Thanks for visiting, Joy! Great review! This seems like such a lovely summer read. I typically enjoy love triangles, so I think I'd really enjoy this novel. Thanks for the review! I think you'd like this one then! Thanks for visiting! I think if you go into it looking for a light read, you won't mind the astrology or the love triangle. It's definitely the kind of book you throw into your beach bag. Thanks for visiting, Christina!